Place the tomatoes and garlic in a medium (3-quart) saucepan and cover with water. Set over medium-high heat and simmer until the tomatoes are thoroughly cooked and the skins have started to come off, about 10 minutes. Transfer the tomatoes and garlic, along with 1/2 cup of the cooking liquid, to a blender or food processor. Once it has cooled slightly, add the onion, 3/4 teaspoon of salt, 1/4 teaspoon of pepper, adobo sauce, and chipotle chile if using, and puree until smooth. Sprinkle chicken with oregano, 1/4 teaspoon of salt, and pepper to taste. Heat 4 tablespoons oil in a large, deep and thick casserole or skillet set over medium-high heat. Once hot, sear the chicken thighs about 2 to 3 minutes per side until browned. Remove from skillet, reserve in a bowl. Pour the remaining 2 tablespoons of oil into the casserole, set over medium-high heat. Once hot, add the pasta. Fry the pasta for a few minutes, stirring constantly, until browned, but not burnt, and it smells toasty. Pour the tomato puree over the pasta. It will jump all over the casserole, so you may want to use the lid as a shield over the casserole. Stir, cover partially and let the sauce cook for about 5 minutes, stirring occasionally, until it darkens and cooks into a thick puree consistency. Nest the browned chicken thighs in the pasta, pour the chicken broth on top, stir gently, cover tightly, reduce heat to low and cook for 25 minutes. Remove the lid, sprinkle the cheese all over the pasta and place the casserole uncovered in the oven. Bake anywhere from 10 to 12 minutes, or until the cheese has completely melted and begun to lightly brown. Serve hot. You may garnish with avocado slices and Mexican crema. Cut into thick slices and serve as you would a cake, since there will be a light crust on the bottom and sides and top. I made this last weekend. What a treat! I used gluten-free pasta. The chipotle peppers give it just the right amount of kick, and the flavors work together perfectly. The chicken thighs are so tender. I didn’t have a casserole big enough for a whole pound of pasta, plus I’m single and don’t need to cook that much pasta for me, so I used 8 ounces of pasta and cut the chicken stock down to 1.5 cups. I used a 12″ iron skillet. Pati, your recipes never let me down. You expand my palate, and stretch my Mexican culinary skills! Aww thank you so much for such a lovely comment, Rebekah!! I just made this tonight! This was delicious! I’m definately making it again! So happy to hear this, CC. This was delicious but I am wondering what we might have done wrong. After cooking on the stovetop, our pan was still very wet. There was no way it was going to form any type of light crust with only 10-12 minutes in the oven, so we simmered it longer on the stovetop to remove more liquid. Even after simmering longer and then adding the cheese and baking, it wasn’t possible to cut into slices. Has anyone else experienced this? I liked the flavor, but I would like to have it be closer to the consistency of when we watched this episode. Maybe use less chicken broth? Any suggestions would be appreciated. Thanks. Hmm it sounds like you should use a little less broth next time. But I’m glad you enjoyed it Carrie Anne. wheres the light crust coming from ? That’s from cooking it in the pan…the bottom and edges will get a bit hard. This looks so delicious! It’s interesting because the tomato sauce really reminds me of a similar version my stepmom makes with fresh tomatoes whenever she makes meat sauce for pasta (which is one of my favorites, too 😉 ). I had a question, though. So none of the pans I have in my kitchen are oven-safe. Would it still work if I do all the stove methods first (Sautéing the chicken, pasta, then simmering in the sauce until everything’s cooked) and then transferring to a baking sheet to put in the oven? Sure, Carlos! Or you can also put it in any oven safe pan, like a casserole dish. Enjoy. I wish the recipes said which episode they are from. Thank you for the suggestion Stephanie. I’ve passed it on to my tech team. My kids get so excited whenever they find out I’m making this for dinner. Thank you so much for sharing this as it has become one of our family’s favorite recipes. So happy to hear that it is now a family favorite, Jo! This is a yummy dish as it is but I also like to make it with ground beef. I brown the beef with Pati’s seasonings and then drain off the fat. It is then added to the casserole before it goes in the oven stirred into the pasta. Wonderful flavor! I’m so glad you make it your own, Bonni. Delicious and easy. Don’t think ill bother boiling pasta or use jar sauce again. Pati, you’re awesome! Yay! I hope you have lots more fun making more pasta dishes, Tresa. I don’t know if you remember me but I contacted you after seeing you make this recipe on TV. I made it for my church ministry to feed the poor in our area and it was an amazing success. We fed over 120 needy people in our community with your recipe. I am making it again after almost a year and just wanted you to know how much our guest and we volunteers loved it. Oh thank you for letting me know, John! I’m so happy to hear that everyone loved it…and I hope you have another successful year. Anoche cocine está delicia y estuvo fabulosa. Thomas mi esposo está feliz que me este incursionando en la cocina con tus recetas. He tenido que modificar los tiempos y temperaturas de cocimiento ya que tengo estufa eléctrica, se lleva un poquito más de tiempo. Pero el sabor de tus recetas es fenomenal. Jajaja :). Dices hola a tu mamá y Thomas! Hey pati! I’m 16 and I made this dish twice and it is as you would say phenomenal !! Making it for my mothers birthday and I really hope she enjoys it. That is fantastic Michelle! Please say happy birthday to your mom. I had a neighbor give me many tomatoes and decided to put this method to the test. I kept my recipe Italian using only garlic and basil and used an imersion blender. I also cooked some chicken sausage with feta and spinach and used small shells, cooking them how you describe. I used mozzarella to top. I’m about to take the dish out the oven and have a very good feeling! Thank you for the inspiration, Pati. My wife and I just discovered your show and have added it to the DVR! ¡Que pase un buen dia! I’m so happy you were inspired, Matt! Do you cook the pasta first, Pati – before “toasting” in the pan? Or use dry pasta? You toast the raw pasta…it will then cook in the tomato puree after frying. Can this be made ahead, frozen, and reheated? If so, at what point should I stop with the recipe and finish later? Just saw this episode and cannot wait to try it. Yes, absolutely. You can make it up to the point before you bake it in the oven – or before you add the cheese – let it cool, cover, freeze, and pick it up from there once you take it out of the freezer. There was no crust, but we prefer it not to have a crust. Since she used chipotle powder, maybe next time she will add 1/2 teaspoon of vinegar. Thanks for the great recipe. It is definitely a keeper! What a great adaptation, Ross! For me, there is no substitute for Chipotles in Adobo… I am so wild about them. If you find the chiles too spicy… you can always only use the adobo sauce. So happy to hear you found a keeper! Thank you for including the weight of cheese! It is easier to weigh out shredded cheese and get a consistent amount rather than putting shredded into a cup measure and hoping it is not too loose or tightly packed. I made this with left over pork loin which I sliced to the size of chicken thighs. I warmed up the pork in the skillet before I cooked the pasta and it was delicious!!! Thank you, Chef Pati! Turned out more like a goulash. No crust formed after baking it for 15 minutes. Used chicken breasts instead of thighs. The spice left a weird, bitter after taste. What other meat can you use instead of chicken? You can really play here Betty! You can use shrimp (just sear for a few seconds per side), chorizo (cook until lightly browned), any cut of diced meat (sear a couple minutes per side). You can always add vegetables as well! Could I use rice in place of the pasta? If so, how much rice would you recommend? Absolutely! I’d use 2 cups of extra long or jasmine rice. Thank you. My question concerns the liquid that already is in the canned tomatoes. Will that extra liquid in the can make a difference in the ratio to pasta? Do I use the same amount of chicken stock that the recipe calls for? That is what I did, and when my wife comes home work she will love it and me too! Thank you Pati Jinich you ROCK! I love the whole concept of this receipt. BUT, How can I convert this recipe using canned tomatoes? Just replace one for the other! Just made this for dinner tonight! YUM! I used boneless, skinless chicken breasts (they were on sale), but big ones, and cooked for same amount of time you suggested. Perfect bite when you get a bit of chicken, pasta, sour cream and fresh avocado! Family says this goes on the “make again” list! YAY! Thank you for trying my recipe, Robyn! You can make it without the chipotle in adobo sauce, it will be just as delicious! Tonight I made this dish tonight for supper. I had to half the recipe. If I had made the whole recipe would have way to much for just my husband and I. I only used 1 tsp of Chipotle sauce and no chipotle’s at all. However I must tell you this was the best ever pasta recipe todate! I thank you for sharing and I posted my picture of my supper tonight along with your recipe on my facebook page for all to copy..
Yay! Next time make it all and you will have the MOST wonderful leftovers. Thanks again Mrs Pati for giving us such easy to follow recipes. Love Mexican food but never knew how to cook it. Thank you so much for tuning in! I’m thrilled you like the recipes! Love, love, love your show Pati. Learned a new method of cooking pasta and making this recipe for dinner guests tomorrow. Looks scrumptious — Can’t wait to taste it!! Joe, I’m in metro Atlanta and watch the show on “Create TV (createtv.com)” via PBS. You can try searching for CreateTV in your area — hope this helps. I discovered your site and I will be using quite a few of your recipes. I already make Tamales, enchiladas, my own sauces out of Cascabels, or Habaneros, or Trinidad Scorpions and will be looking forward to cooking your dishes. I would like some help from you in finding your show or making it available around Gainesville, Fl. I am a 36 year restaurant mgr involved in varied styles and a Texan to boot. I have eaten Mexican/Tex Mex since I was a child and love it. I also grow many kinds of peppers to use which helps a lot. Keep at it, your cooking motivates and inspires me to keep cooking different items and trying on the wife!!! Hola! You can find local TV listings by typing in your ZIP code here: http://patijinich.com/tvshow/stations/ So happy you love my recipes! Thank you for writing to me! We tried this recipe tonight and it was wonderful! So easy and so tasty. I always brown my rice but I had never browned pasta, wow! What a difference. Love your show, you are so delightful. 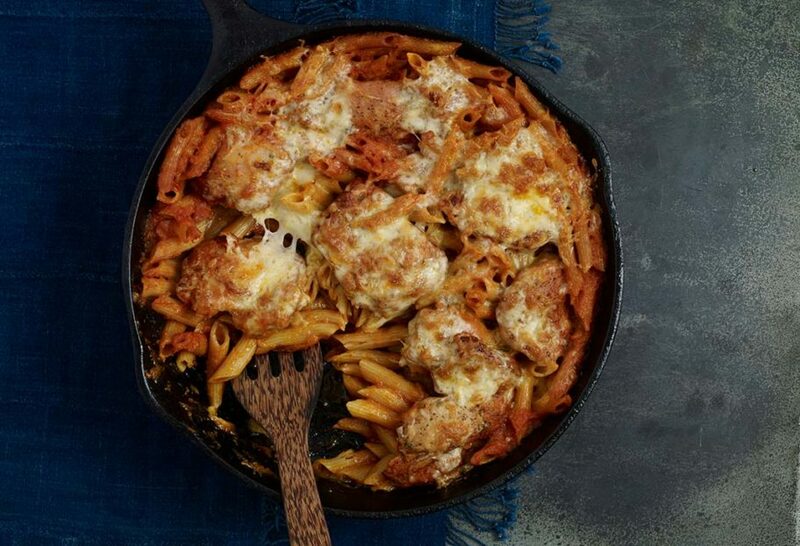 I made the Chicken Chipotle Pasta for dinner last night and it was a big hit with my family… Love it! Yay! So happy everyone loved it! Saw your show earlier this month with the chipolte chicken pasta, as always, looks awesome! Coincidentally, we’ve been looking to add a nice cast iron enameled brassier. Quick question, was the brassier you used on the show 2.5, 3 or 4 quart??? -Tomatoes have to be ripe, also season that tomato broth as well. -Use good and well seasoned chicken broth or stock. – Did you taste the cheese that you used? Many cheeses in stores these days are way too mild. Choose a brand that gives you a cheese that tastes! Hope this helps… should turn out phenomenal! Hi pati, I saw your show this weekend and you made Chipotle chicken pasta casserole. It looked so good I had to try it, I am allergic to tomatoes,so used roasted red peppers instead and it is awesome! Thanks for sharing your Mexican table! Sounds delicious with red peppers! Thank you so much for trying it!! I watch your show all the time. This last Saturday your show was on all day.. YUM!!! I made the chicken and pasta cassarole. I love your recipes because you layer flavors instead using tons of cumin like most Mexican recipes I find on the internet. I like to cook and use recipes as more of a guide with suggestions. But because I wanted a real Mexican meal I followed your recipe except I did not use chipolte in adobo. I used a sauce I made with dried Pasilla peppers. It was kind of bland and I know it is because my sauce was bland. Do you have any suggestions to flavor my bland pepper sauce. The chicken was amazing even by itself. Thank you. Hola Tiffany, Thank you for watching! Next time, try quickly toasting your chiles on a hot comal or skillet to bring out more flavor. Hi Pati, thanks again for the recipe. We made it as written and our guests enjoyed it, but I feel like adding a couple of charred peeled poblanos to the vegetable blend and a couple TB of tomato paste would have amped up the flavor even more. We love your show! Hola Sherley, Thank you for writing and for watching! You may always halve my recipes. For this chicken and pasta casserole; should the dry pasta be cooked first before frying in the oil? Nope! It fries and then cooks in the tomato broth.